Crédit : nous remercions tous nos partenaires (dont CNES, ESA, NASA, etc) pour les images et photos mises à notre disposition. LPC2E/CNRS, 3A Avenue de la Recherche, 45071 Orléans Cedex 2, France. The scientific objectives of DEMETER are related to the investigation of the ionospheric perturbations due to the seismic activity, and to the global study of the Earth electromagnetic environment. The scientific payload is composed of several sensors: - Three Electric and three magnetic sensors (6 components of the electromagnetic field to investigate from DC up to 3.5 MHz), - A Langmuir probe, - An ion spectrometer, and, - An energetic particle analyzer. They are associated to two special equipments: a large onboard memory (8Gbits) in order to record data all around the Earth, and a high bit rate telemetry in X band (18 Mb/s). There are two modes of operation: (i) a survey mode to record low bit rate data, and (ii) a burst mode to record high bit rate data above seismic regions. In the survey mode the telemetry is of the order of 950 Mb/day, and in burst mode, it is larger than 1 Gb/orbit. The launch by CNES (French National Space Agency) will be in 2003, and the duration of the mission is 2 years. DEMETER is a micro-satellite (110 kg) with a low-altitude (< 710 km) and a nearly polar orbit. Among all earthquake precursors, those related to the electromagnetic field are the most puzzling, and the many possible sources of noise are cause of lively controversies. A large number of laboratory experiments clearly suggest that micro-fracturing is associated with the appearance of spontaneous charge production (electrification) and transient Electric or ElectroMagnetic (EM) Emission. Many electric and magnetic preseismic and co-seismic effects have been reported in the past as well as ionospheric perturbations. Satellite data also show EM transients related to the seismic activity but up to now, observations are not performed by experiments dedicated to this study. The scientific objectives of DEMETER are related to the investigation of the ionospheric perturbations due to the seismic activity, and also to the global study of the Earth electromagnetic environment. The experiment onboard the DEMETER micro-satellite is proposed by a group of scientists involved in external and internal geophysics. The list is given in Table 1. TABLE 1. List of DEMETER experimenters. They are working on the scientific topics which are described in section 2. They will built the scientific payload which is described in section 3 and they will define the operations (section 4). Section 5 will give a short overview of the data processing. The platform of the micro-satellite will be built under the CNES (French National Space Agency) responsibility. The main scientific objectives of the DEMETER experiment are to study the disturbances of the ionosphere due to the seismo?electromagnetic effects, and due to anthropogenic activities (Power Line Harmonic Radiation, VLF transmitters, HF broadcasting stations). The seismo?electromagnetic effects are the electric and magnetic perturbations caused by natural geophysical activity such as earthquakes and volcanic eruptions. It includes: electromagnetic emissions in a large frequency range, perturbations of ionospheric layers, anomalies on the records of VLF transmitter signals, and night airglow observations . Such phenomena are of great interest, because they start a few hours before the shock and can be considered as short?term precursors. Electromagnetic emissions in the ULF/ELF/VLF range that are related to seismic or volcanic activity are known since a long time but their generation mechanism are not well understood. Many papers have presented ground observations of wave emissions during seismic events . Examples can be found in . Two types of emissions can be considered. First, precursor emissions occur a few hours before earthquakes, in a large frequency range from one hundredth Hertz up to several MHz. Second emissions observed after the shock generally are attributed to the propagation of acoustic?gravity waves . However, all hypotheses concerning the generation mechanism of precursor emissions are also valid after the shock, when the Earth's crust returns to an equilibrium state. The emissions can propagate up to the ionosphere, and observations made with low?altitude satellites have shown increases of ULF/ELF/VLF waves above seismic regions. In contrast to ground experiments, satellite experiments cover most seismic zones of the Earth, and statistical studies become meaningful because of the much larger number of recorded events. Since the great Alaskan earthquake in 1964, many evidence of electron density perturbations in the ionosphere after strong earthquakes have been reported. Ionospheric perturbations have been observed a few days before above the seismic zone. They are better detected during the night when the ionosphere is calm. Increases as well as decreases of the critical frequencies are observed in different regions of the ionosphere before earthquakes. Additional information provided by GPS measurement such as TEC (Total Electron Content) data will be used. Wave emissions and electron density perturbations can be linked through various mechanisms in the ionosphere and the same hypotheses of generation mechanism of precursor are valid for the two perturbations. These hypotheses are mainly related to: wave production by compression of rocks, diffusion of water in the epicentral area, and redistribution of electric charges at the surface of the Earth and then in the Earth's atmospheric system. Only a statistical study with many events will show the general behaviour of such ionospheric perturbations and will help to define a signature of ionospheric perturbations prior to earthquakes . This will be achieved with the data of the wave experiment. In the interaction between the solar wind and the Earth's magnetic field, the ionosphere is the first protective layer around the Earth. Therefore the study of its evolution and its perturbations are of great interest. The second objective of the DEMETER experiment are related to perturbations coming from the Earth's surface and due to man?waves (PLHR, VLF transmitters, HF broadcasting stations). The Power Line Harmonic Radiation (PLHR) is the ELF and VLF waves radiated by electric power systems at the harmonic frequencies of 50 or 60 Hz. Evidence of PLHR Propagation in the magnetosphere was first observed on ground. However direct observations by satellites are rather rare  and shown in few papers (indirect effects are more often reported). The observations show that the lines drift in frequencies and that it is most probably due to a non?linear interaction between electrons and the coherent waves. All the observations indicate that PLHR influences the atmosphere?ionosphere?magnetosphere coupling. On one hand, non linear interactions between electrons and PLHR can participate in the precipitation of electrons from the slot region in the radiation belts, on the other hand, main part of the PLHR energy dissipates in the lower ionosphere and modifies the ionospheric currents. This problem now requires serious attention because the electrical power consumption is always increasing in the world. At VLF frequencies between 10 and 20 kHz, the ground-based transmitters are used for radio-navigation and communications. Their ionospheric perturbations include: the triggering of new waves, ionospheric heating, wave-electron interactions, and particle precipitation. At HF frequencies, the broadcasting stations utilise powerful transmitters which can heat the ionosphere and change the temperature and the density. All these wave dissipations in the ionosphere could participate to the global warming of the Earth because the change in global temperature increases the number of natural lightning discharges in the atmosphere. Then the supplementary lightning discharges produce more magnetospheric whistlers which could produce heating and ionization in the lower ionosphere. Furthermore, it is a feedback mechanism because two different processes could be involved. First, lightning is a source of NOx, and NOx affects the concentration of ozone in the atmosphere which contributes to the greenhouse effect. Second, precipitation of energetic electrons by man?made waves may trigger other lightning discharges. It explains the importance of the study of such man-made waves . Ionospheric perturbations by natural geophysical activities have been made evident by two methods: the study of the electromagnetic waves, and the measurement of the electron density. - Four Electric sensors in order to measure the three components of the electric field. The distance between each probe is of the order of 9 meters tip to tip. - A three axis search coil magnetometer to measure the three components of the magnetic field. This magnetometer will be located at the end of a 1m boom. - An energetic particle analyzer. They are associated to two special equipments: a large onboard memory (8Gbits), and a high bit rate telemetry in X band (18 Mb/s) which are built under CNES responsibility. The experiment capabilities are given in Table 2. The power consumption of the scientific payload is of the order of 15 W.
- Waveform of one electric component up to 3.5 MHz (snapshots). - Results of a neurone network to detect whistlers and sferics. For the other experiments, the difference between the Burst and the Survey modes only concerns the time resolution of the data. The number of telecommands is estimated to be of the order of 600 octets/3 days. The orbit of DEMETER will be LEO, polar, and with an altitude around 710 km. The launch is expected to be in 2004, and the duration of the mission is 2 years. The telemetry will be received in Toulouse. The data processing center will be located in LPC2E, Orléans. We will perform correlation with seismic activity using data from the GEOSCOPE network. Quick-Looks of the data will be available in free access on a WEB site dedicated to the experiment. The data processing center will be also in relation with ground-based experiments. It is expected to have close collaboration with ground-based experiments performing measurements of DC fields, electromagnetic noise in various frequency bands, ionospheric parameters, optical parameters,.... The satellite data will give an overview of the ionospheric parameters above the regions where these ground-based measurements are performed. Mutual comparison of all parameters (ground-based and satellite recorded) will allow to understand the generation mechanism of the EM perturbations registered during seismic activity. A call for guest investigators will be emitted by CNES in order to formalise the collaboration and the exchange of data between scientists interested by the DEMETER mission. 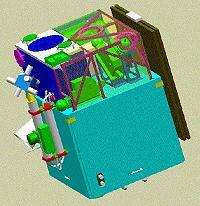 The micro-satellite DEMETER in launch configuration (CNES document). The dimensions are 60 x 60 x 80 cm3 and the weight is around 110 kg. The solar panel in black can be seen on the right. The scientific payload is located in the upper part. On the left there is a boom supporting the three magnetic sensors and the Langmuir probe. Three of the four spheres for the electric sensors can be seen in green. Map of the Earth where locations of the Burst mode are indicated in grey (from Pascal Bernard, IPGP). Parrot, M., et al., "High-frequency seismo-electromagnetic effects", Physics of the Earth and Planetary Interiors, Vol.77, pp.65-83, 1993. Parrot, M., "Electromagnetic noise due to earthquakes" in Handbook of Atmospheric Electrodynamics, v.II, Ed. by H. Volland, CRC Press, Boca Raton, pp. 95-116, 1995. Serebryakova, O.N., et al., "Electromagnetic ELF radiation from earthquake regions as observed by low?altitude satellites", Geophysical Research Letters, Vol.19, pp.91-95, 1992. Pokhotelov , O.A., et al., "Response of the ionosphere to natural and man made acoustic sources", Annales Geophysicae, Vol.13, pp.1197?1210, 1995. Parrot, M., "Statistical study of ELF/VLF emissions recorded by a low altitude satellite during seismic events", Journal of Geophysical Research, Vol.99, pp.23,339?23,347, 1994. Parrot, M., "Observations of PLHR by the low-altitude AUREOL-3 satellite", Journal of Geophysical Research, Vol.99, pp.3961-3969, 1994. Parrot, M. and Zaslavski, Y., "Physical mechanisms of man made influences on the magnetosphere", Surveys in Geophysics, Vol.17, pp.67-100, 1996.